Southside Ashpole Elementary in Rowland, NC will be closed on Wednesday, September 12, 2018 and for the remainder of the week due to the impending severe weather forecast for large parts of North Carolina. Southside Ashpole Elementary, part of the Innovative School District, will follow the direction of Public Schools of Robeson County (PSRC) regarding school closings in Robeson County associated with Hurricane Florence. See the message below from PSRC Superintendent Dr. Shanita Wooten. The Public Schools of Robeson County’s district administrators and central office staff have been monitoring the approach of Hurricane Florence over the past few days. Florence is projected to make landfall later this week and could bring high winds and as much as 15 inches of rain according to the National Weather Service. After careful consideration and consultation with Robeson County’s Emergency Management and local law enforcement, the Public Schools of Robeson County’s district administrators have decided that all schools and district offices will be closed on Wednesday, September 12, 2018 and for the remainder of the week. This cancellation also includes all extracurricular activities, school-sponsored programs/events, drive education classes, etc. Facility rentals made through the Community Schools Department will also be cancelled. Beginning Tuesday, September 11, 2018, there will be no PSRC sponsored activities or meetings after 3:00 p.m. All district office and school employees will be required to leave schools/offices by 4:00 p.m. once buildings have been secured. We are preparing for the likelihood of opening shelters and using school buses to help with evacuations. 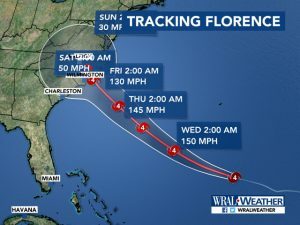 All decisions are subject to change depending on updated briefings from the National Weather Service (NWS) and Robeson County Emergency Management Officials. The district administrative team will continue to monitor the progression of Hurricane Florence and will provide an update by Sunday evening, September 16, 2018, if further schedule changes are necessary. Any future announcements will be made using the district’s automated calling system. Please refer to the district website, social media sites, and email for updates. We will also contact local news media with the most up-to-date information. Principals and essential personnel must ensure cell phones are charged and readily accessible at all times. During hurricane recovery, the principal of each school must be the first point of contact and should contact appropriate staff members once initial contact has been made by the school district administrators, county officials and/or the American Red Cross. Take this situation seriously and make the necessary precautions to keep your loved ones out of harm’s way. Heed all emergency warnings and make every effort to stay safe. Travel only when it is deemed safe. We will be in touch as the situation progresses.